Did you know that recently, minimalistic, baggage-free travel has been becoming popular in Japan? It is an entirely new way of traveling which doesn't require heavy packing or a detailed itinerary. Reoma Resort offers this type of service and has several different travel plans for guests at Hotel Reoma no Mori. MATCHA's editorial team had the opportunity to experience this travel and had an amazing time, simply by choosing a travel plan! Stay at Hotel Reoma no Mori and Join a One-Day Bus Tour! In response to guests’ wishes to explore the area surrounding the hotel, Reoma Resort created a special one-day sightseeing bus tour for their lodgers. The one-day bus tour includes traveling to well-known tourist spots nearby and is divided by theme into several categories. The itinerary and the activities are seasonal, therefore allowing you to have a different experience each time you visit. You must pay an additional fee for this tour. However, this is inclusive of everything on the tour: the round-trip ticket fare, tour guide, and admission fees for the destinations you are going to. Please note that the tour fee may vary depending on the itinerary. In order to take part in the day-trip bus tour, you have to make a reservation first. You can either make a phone reservation beforehand or make one at the front desk when checking in. You can make a reservation until 17:00 on the day before the tour. Find out more about the day-trip by clicking on this link (Japanese). Finally, the day of our day trip has come! Meet at the lobby on the 4th floor of Hotel Reoma no Mori. Alert the employee stationed at the desk with “Optional Tour Boarding Front Desk” written on it. This time we chose the Birthplace of Sanuki Udon And Konpira Shrine Route. 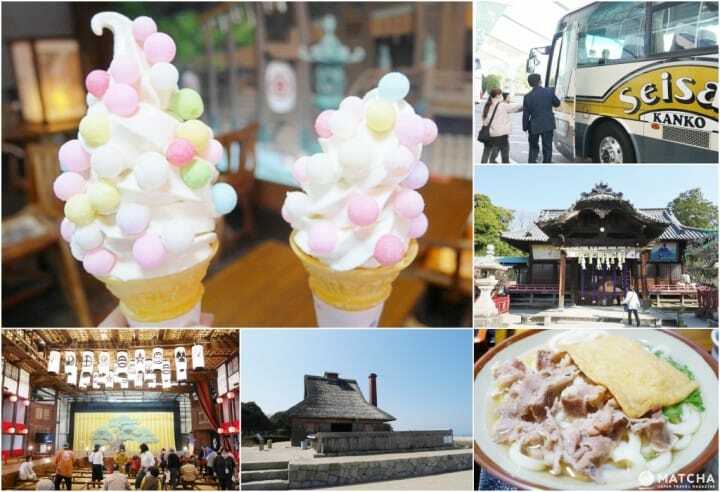 The schedule for the day is full of interesting sites and activities, such as discovering the origins of Kagawa's famous sanuki udon, seeing Kotohira Shrine and Kanamaru-za, a spot known for kabuki, and visiting udon restaurants. ** Our assembly time was 8:00, and the return time to the hotel was 15:00. The starting time may vary by tour. If you are not staying the night of your tour at Reoma Resort, check out before the assembly time, and leave your luggage in the coin lockers. The first place on our to-visit list is known as the birthplace of udon: Takinomiya Tenmangu. Japanese people believe that udon was first introduced to Japan by a Buddhist monk named Kukai, who transported it from China (this is one theory). According to the priest of Takinomiya Tenmangu, this shrine was once a Buddhist temple. It is said that Kukai taught his nephew Chisen, the first chief monk of the temple, how to make udon. Chisen first prepared udon for his parents when they fell ill. Due to this, the shrine's has become associated as the birthplace of udon. As you pass the plum garden at Takinomiya Tenmangu, you will see the Takinomiya Shrine. Make sure to pay special attention to the honden (main hall where deities are enshrined), built on higher ground. Ordinarily, the honden of a shrine is built on a secluded place inside the grounds and it is difficult to see its structure. However, the honden of Takinomiya Shrine can be seen from the outside. In addition, the stone wall underneath the honden is believed to bring good luck to visitors who touch it. You will see many people pressing their hands against it with their eyes shut. On our way out, we received a present from the shrine priest. We had a memorable time at Takinomiya Shrine, the birthplace of udon! Next to the birthplace of udon is Takinomiya Roadside Station, where you’ll find udon noodles available for purchase. In addition to ordinary noodles, you’ll also get the chance to buy ice cream combined with udon, as well as goods featuring Kagawa’s mascot, Udonnoww. Each item here is quite popular! Located on the shores of the Seto Inland Sea, Kagawa Prefecture has developed unique technologies, including producing salt irihamashiki-style. Salt has been made in the city of Utazu for more than 1300 years. Here you can even admire a historical salt field that has been restored (known as "Fukugen-Enden" in Japanese). Utazu’s salt is valued for its rare and fine structure, as it is made by hand. You can also purchase it at Utazu Umi Hotaru, next to the salt field. However, it isn't just the fascinating salt that will leave you speechless, as the vast sea spreading out in front of you is also impressive. On a clear day, you can admire the magnificent view of the Great Seto Bridge. During our trip we were lucky to have the chance to make salt under the bright blue skies of Kagawa! We continue our trip by bus again, heading away from the sea and towards the mountains. In the Kotohira district, we discovered the most historic theater house in Japan, Konpira Grand Theatre Kanamaru-za. Kanamaru-za was built in 1835 and is currently designated as one of Japan’s Important Cultural Properties. Historically it was a facility for lively entertainment, intended for fun and relaxation. It has remained like this since, and holds the Shikoku Konpira Kabuki Grand Theatre every spring. This festival where kabuki stars and masters showcase their skills and performance is held only once a year. Kanamaru-za, famous for its kabuki, is well preserved and remains in an impeccable state to this day. We are sure you will be in awe of the extravagant interior here. You may feel as if you've been transported back in time watching a kabuki play. Lunch was included in our trip fee, so we took the opportunity to savor a delicious meal! Konpira Omotesando contains many restaurants, but this time we went to Nakano Udon School’s store, Udon Chaya Tentekomai, an establishment popular with locals. With our meal ticket we were able to select a bowl of udon and one additional dish of our chice (like tempura and rice balls). However, the tour left us very hungry, so we ordered an extra dish each. They also sell great souvenirs, too, in addition to the chewy, homemade udon noodles. Don't miss the opportunity to bring back tasty udon with you, especially if you are a fan of these noodles. There is one more delicacy not to miss when in Konpira Omotesando: adorable yomeiri-oiri soft serve ice cream! This lovely snack is a soft-serve dessert with charming oiri (*1), a Kagawa specialty, sprinkled all over it, made by Nakano Udon School Nakanoya. It also looks amazing as well as having a refreshing and delicious taste. Don't forget to take a picture before you treat yourself! After a satisfying meal, head to Kagawa’s most well-known sightseeing spot: Kotohira Shrine (Kotohira-gu). Similar to Mie Prefecture's Ise Jingu, Kotohira Shrine is one shrine everyone in Japan wants to to visit in their lifetime. However, you must pray or pay your respects at Kotohira-gu only after you’ve climbed 1,368 stairs to reach it. After you’ve climbed 785 stairs, you’ll notice the hongu, or main shrine. Next to it is a platform where you can gaze at Mount Iino as well as Sanuki Plain. Climb another 583 steps, and you’ll finally be able to admire the shrine at the top ("okusha" in Japanese). Unfortunately, we didn't have enough time to climb all the way up to the top. Instead, we decided to pay our deepest respects at the main shrine. On our way back to the hotel, our guide gave us a special candy as a souvenir. This unique treat lets you share good luck with others by breaking the golden candy with a small mallet inside the package. We thought this was the perfect gift to receive at the end of our trip! Take the Chance and Go on a Tour! This is a perfect opportunity to enjoy both your stay at the onsen (spa) hotel and a great sightseeing trip at the same time, without much hassle! At Reoma Resort, not only can you have a great time at the onsen hotel, but you can also have an entertaining day at the huge amusement park, view beautiful flowers at the garden, enjoy the night view, and sample gourmet cuisine. This resort has everything a traveler could want, regardless of the age or background. If you don’t want to schedule your trips or plan an itinerary, definitely visit Reoma Resort for a fun and relaxed vacation! This time we have prepared a Reoma Hotel no Mori lodging coupon available exclusive to readers of MATCHA. Save the coupon displayed below and show it to a hotel staff member upon checking in. MATCHA coupon. Please show the original coupon (down below). Receive a 2000 yen discount per room by showing this MATCHA coupon when checking into the hotel. ** Inform the staff you read this MATCHA article when making a reservation. ** This coupon is for guests to the hotel paying with cash or credit card only. Use it on the day of your visit at the hotel. ** You can show the coupon on your smartphone during check-in. ** You cannot use this coupon in conjunction with another coupon, or while taking advantage of other discount services. Please note that this coupon is intended for individual travelers.